You'll visit kid-friendly attractions like Waychinicup National Park and Greens Pool. Take a break from the city and head to Kalgan River and Dolphin & Whale Watching. 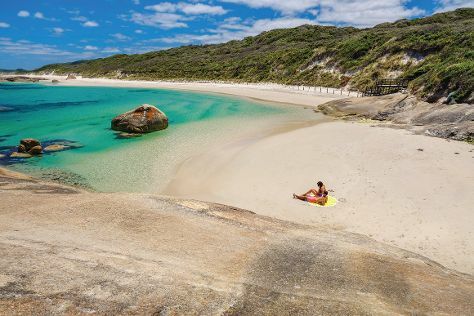 Change things up with these side-trips from Albany: Denmark (Anvil Beach, Harewood Forest, & more) and Walpole (Giant Tingle Tree, Walpole-Nornalup Inlet, & more). The adventure continues: take in the dramatic natural features at The Gap and Natural Bridge, don't miss a visit to Padre White Lookout, identify plant and animal life at Muttonbird Beach and Shelter Island, and stroll through Little Beach. Discover how to plan a Albany trip in just a few steps with Inspirock's itinerary builder. In December, plan for daily highs up to 26°C, and evening lows to 13°C. Finish your sightseeing early on the 5th (Sun) so you can travel back home.